Measurements: 3.25 x 4.65 inches, or 82 x 118 mm. Large. Back of card: Same colors, same line weight as the front! Inside a thin border, two swords & two staves make an X. Two cups and two coins make a +. May be inverted. Does not contrast well with the front of the card. Book included: Yes, 207 pages, 6 x 9 inches, or 15.4 x 23 cm. Illustrated. I regret to say the illustrations of the deck in the book are better than the ones printed on the cards. The book is printed black on white. Pity the deck is not. Publisher: Llewellyn. Printed in the US. Comments: I have too much respect for Brian Williams to like this deck. It is based on the German literary classic, Das Narrenschiff, or The Ship of Fools. The idea is that a bunch of fools have put to sea & have lots of adventures. Williams says the German original was an allegory of the soul & its adventures, which may be true. The middle ages did not lack for allegorical adventures, especially those with a religious slant. But to me, only a few of the original illustrations (as shown in the book) look as if they have allegorical meanings. For the most part, Das Narrenschiff looks like a 500 year old joke book. The relation of the book to a tarot deck is that since a fool starts off a deck of tarot cards & as some have seen the other 77 cards in the deck as his further adventures, a tarot deck would be a good way to reinterpret the old German book. Decide for yourself. Myself, I don't think it profits us to reduce everyone & everything to a fool. That ham sandwich you had for lunch can be reduced to proteins, starches & sugars, but what would be the fun of eating that? A deck of fools over emphasizes & distorts the essential nature of the Fool while rendering the remaining figures mere cameos. Fools in this deck more closely resemble court jesters - look at the hats. Not for nothing did Pamela Coleman-Smith show the Fool bare-headed. Jesters, as we know, were clowns that were wiser-than-they-let-on. Supposedly. Sometimes I think they were just idiots, kept around for the occasional laugh. I imagine small children could have played the role equally well, but would tend to grow out of it. Tarot defines a fool as someone who can learn. A court jester is defined as someone who could not learn. Francois Villon (1431 - disappeared 1463) was the most famous of the French troubadour/poet/jesters, but he is the exception. Oddly enough, he is exactly contemporary with Das Narrenschiff (1494). The only German jester that comes to mind is the Pied Piper (pied being the French word for foot). Like Villon, he is remembered for a certain nasty streak. So if we equate jesters & troubadours with the Fool & take two notable jesters as examples, what does this do to our golden-hearted Fool? Why do moderns insist on glorifying a past that did not exist? As I mentioned, the illustrations in the book, stark black-on-white, are easier to read than the cards themselves. In the book, Williams shows us illustrations from the original Narrenschiff. These were woodcuts. They have a different look & feel from the deck's pen & ink drawings. The woodcuts are generally better. 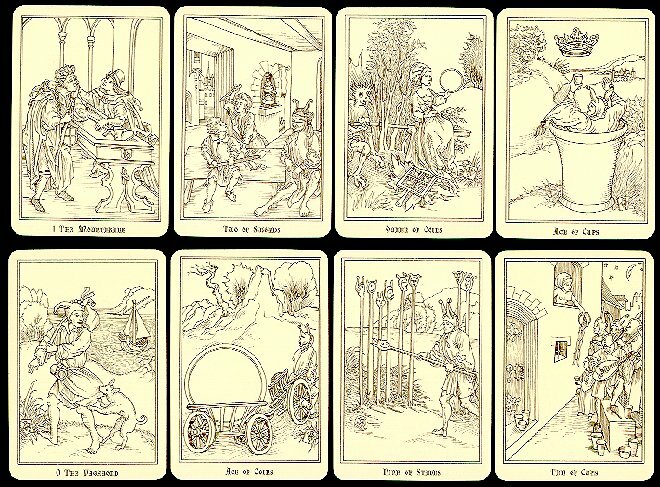 Williams has illustrated two other tarot decks, The Renaissance Tarot, and, Minchiate Tarot Deck. Line weights (on the thin side) are identical in all three decks. The other two decks are colored, which improves them greatly. In the Fools deck, with its monotonous line weights, not very contrasty printing & lack of color, the result is uninteresting & hard to read. Medieval artists did not produce thousands of woodcuts because they loved their spare, classical look. They did not carve bleached white wooden statues & stick them in churches. Medieval artists used color whenever & where ever they could. The statues - which we see today as colorless - were originally brilliantly polychromed. Churches, especially the Romanesque, had beautifully painted interior walls. Woodcuts were simply a cheap way of printing, intended for a mass market, as much as a mass market might be said to have existed. They were thought of about as highly as today's morning newspaper. Early tarot - the great pioneering decks we treasure today - were painted in colors right from the start. The Ship of Fools deck would be greatly improved were it printed in color. Williams' approach to the tarot is strictly classical. The usual major arcana, the usual minor arcana, the usual suits, the usual face cards, etc. The book contrasts both this deck & the original German with the Rider & Marseilles decks. A comparison Williams has made before with his earlier decks.